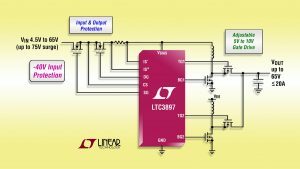 Linear Technology Corporation announces the LTC3897, a multiphase synchronous boost DC/DC controller with input surge stopper and ideal diode controller. 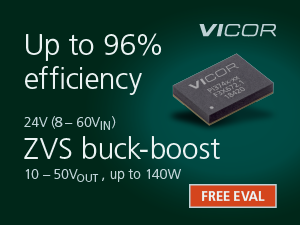 The boost controller drives two N-channel power MOSFET stages out-of-phase to reduce input and output capacitor requirements, enabling the use of smaller inductors versus the single-phase equivalent. 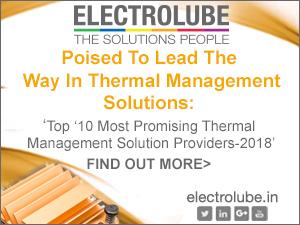 Synchronous rectification increases efficiency, reduces power loss and eases thermal requirements. The input surge stopper, with adjustable clamp voltage, controls the gate of an N-channel MOSFET to protect against high input voltage transients of greater than 100V and provides inrush current control, over-current protection and output disconnect. 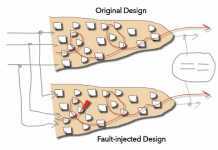 The integrated ideal diode controller drives another N-channel MOSFET for reverse input voltage protection and voltage holdup or peak detection. The LTC3897 is ideal for automotive, industrial and medical systems where a step-up DC/DC converter is needed to efficiently deliver high power in a small solution size. For example, the LTC3897 can be configured to regulate a 24V/10A output from a car battery (12V) at up to 97% efficiency. The LTC3897’s low 55µA quiescent current in Burst Mode operation further extends battery operating life and minimizes power loss at light loads. The LTC3897 itself operates from an input voltage ranging from 4.5V to 65V, with 75V peak. It can regulate an output voltage as high as 60V and the powerful onboard adjustable 5V to 10V gate drivers are capable of slewing large logic-level or standard threshold MOSFET gates quickly. In keep-alive applications where the input voltage may exceed the regulated output voltage, the LTC3897 allows the synchronous MOSFET to be kept on continuously so that the output voltage follows the input voltage with minimal power loss. 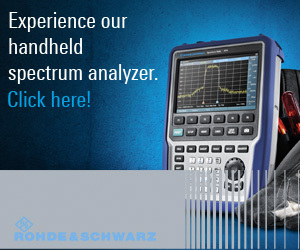 The LTC3897 current mode control architecture uses a phase-lockable frequency from 75 kHz to 850 kHz or fixed frequency adjustable from 50 kHz to 900 kHz. In addition, this device features adjustable cycle-by-cycle current limit and can use a sense resistor or monitor the voltage drop across the inductor (DCR) for current sensing. 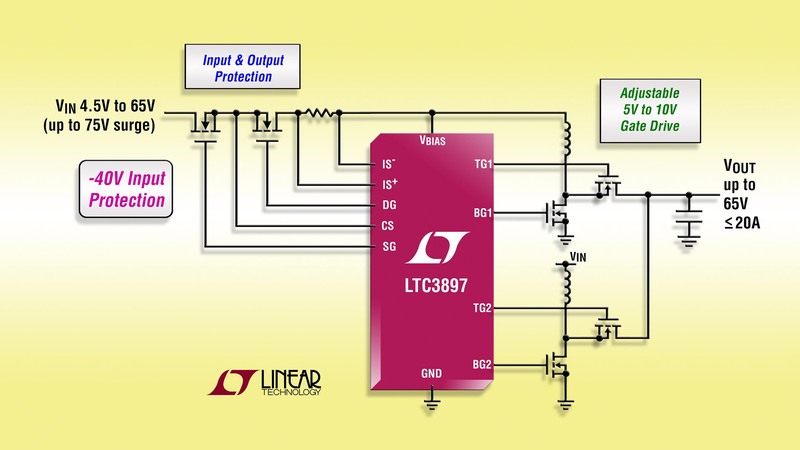 The LTC3897’s boost controller, surge stopper and ideal diode can be shut down independently. Furthermore, the LTC3897 has adjustable soft-start, a power good output and maintains ±1% reference voltage accuracy over an operating junction temperature range of –40°C to 125°C. The LTC3897 is available in TSSOP-38 and 5mm x 7mm QFN-38 packages. Three temperature grades are available, with operation from –40 to 125°C for the extended and industrial grades and a high temp automotive range of –40°C to 150°C. The 1,000-piece price starts at $5.50 each. 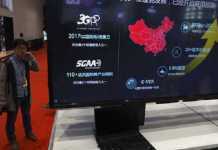 For more information, visit www.linear.com/product/LTC3897.